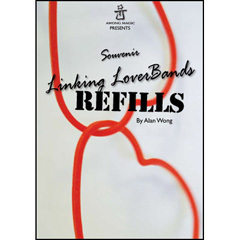 Linking LoverBands is a strange beautiful visual dream. Two separate red bands suddenly link...then slowly and visibly morph into two rubber band hearts! It's the perfect romantic souvenir for the ladies. You have the pure astonishment of the impossible link...combined with the powerful emotional hook of two hearts forever together. Note: Instructions or routines NOT included.